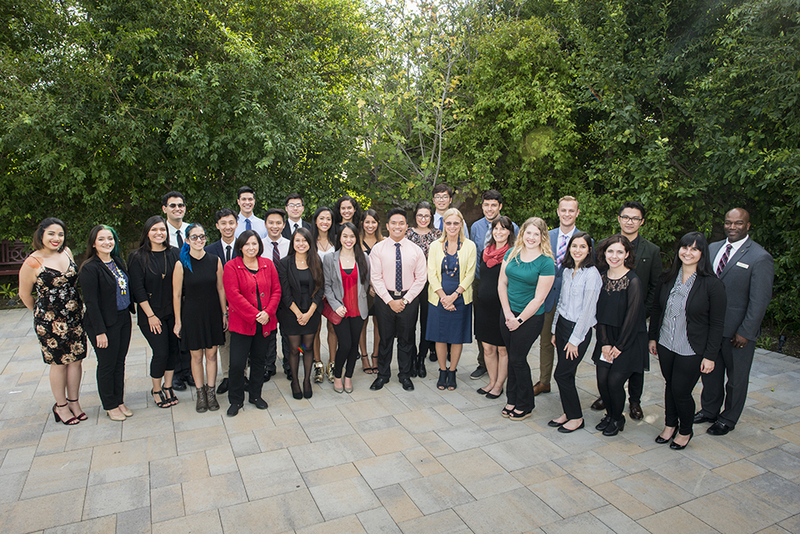 The 2017 California State University, Northridge University and Presidential Scholars. Photo by David J. Hawkins. 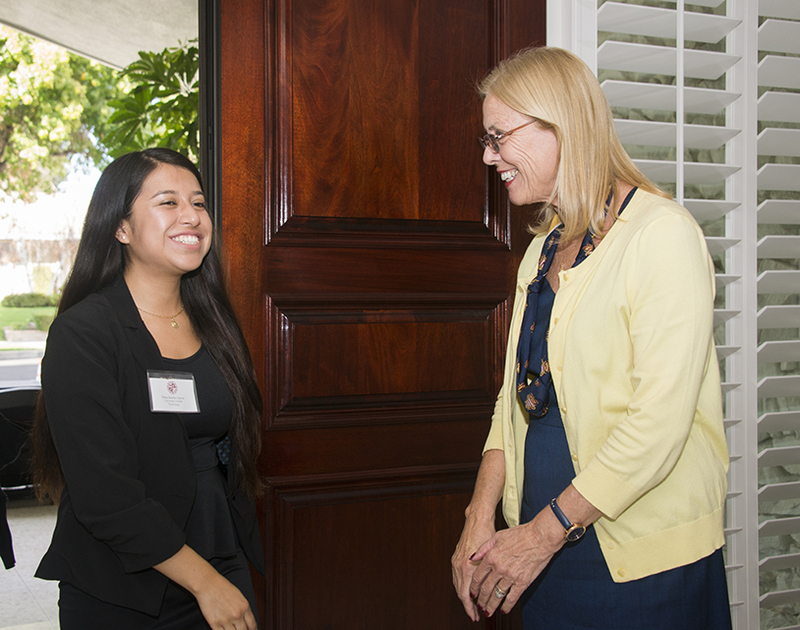 Psychology major Diana Sanchez, a 2017 University Scholar, speaks with CSUN President Dianne F. Harrison. Photo by David J. Hawkins. Deaf Studies major Katelyn Larson, a 2017 CSUN University Scholar, introduces herself at the Northridge Scholars reception. Photo by David J. Hawkins. 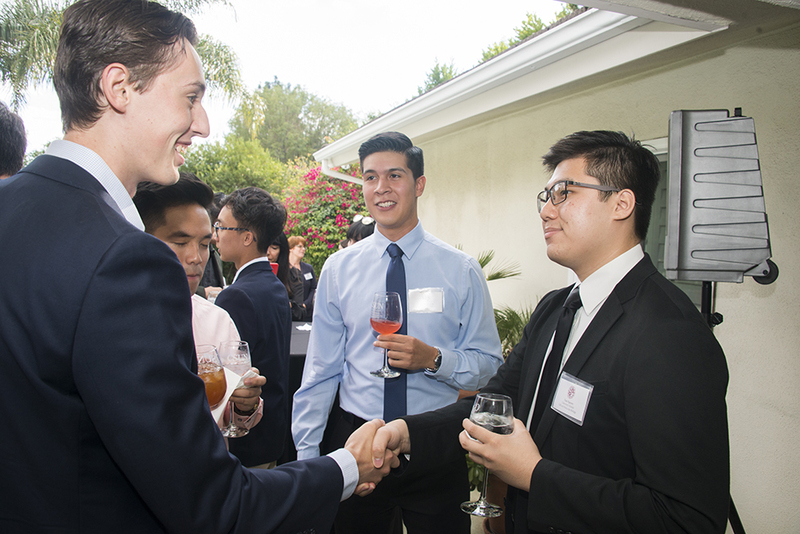 CSUN Associated Students President Johnathan Goldenberg meets 2017 Northridge Scholarship recipients Toan Nguyen (Cell and Molecular Biology) and Nicholas Cervantes (Kinesiology Exercise Science) at the Oct. 20 reception. Photo by David J. Hawkins. 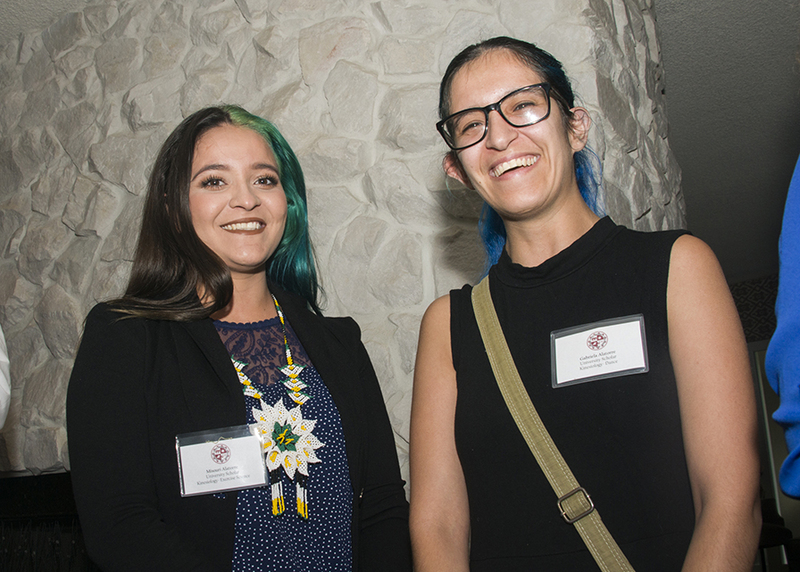 Twin sisters Misouri Alatorre (Kinesiology - Exercise Science), left, and Gabriela Alatorre (Kinesiology - Dance) both received 2017 University Scholarships. Photo by David J. Hawkins. 2017 CSUN Northridge Scholars. Photo by David J. Hawkins. 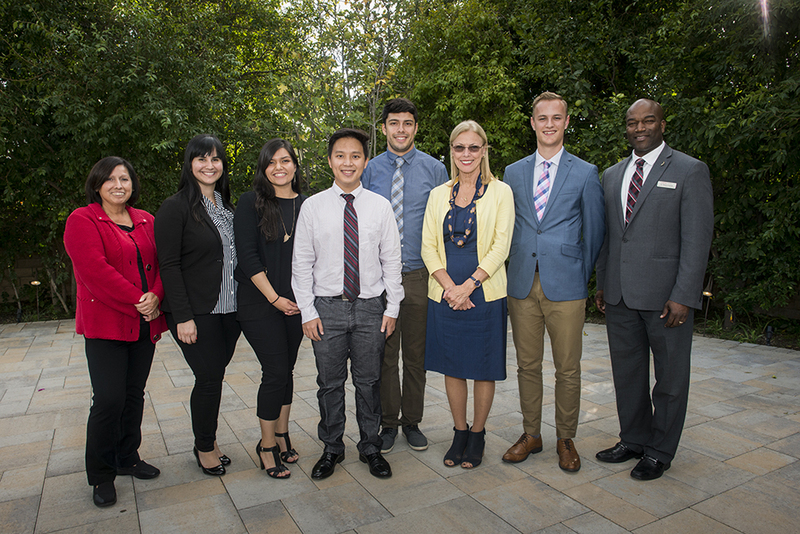 Some of the highest-achieving California State University, Northridge students gathered in the backyard of the University House, home to CSUN President Dianne F. Harrison, to be recognized for their achievements at the Oct. 20 Northridge Scholars Reception. The students were part of the Northridge Scholars Program, a merit-based scholarship program that includes the University Scholarship and the Presidential Scholarship. Of the 218 undergraduate students who applied for the University Scholarship this year, just 22 were selected. Each was awarded $7,500. University Scholars engage in scholarly development activities, such as attending conferences, as they deeply explore their field of interest. Just 10 of 21 students who applied were awarded a Presidential Scholarship, which includes $10,000 and the opportunity to work on yearlong projects with faculty mentors. The University Scholarship is funded by the Bayramian Family Scholarship Endowment. The Presidential Scholarship is funded by Associated Students, the Bayramian Family Scholarship Endowment, the Blenda Wilson Scholarship, the Diane Ryan Scholarship Endowment and the Medtronic Minimed Endowment. The generous scholarships are critical to helping students succeed, Harrison said. She noted that prior scholars have graduated with honors and gone on to earn advanced degrees. 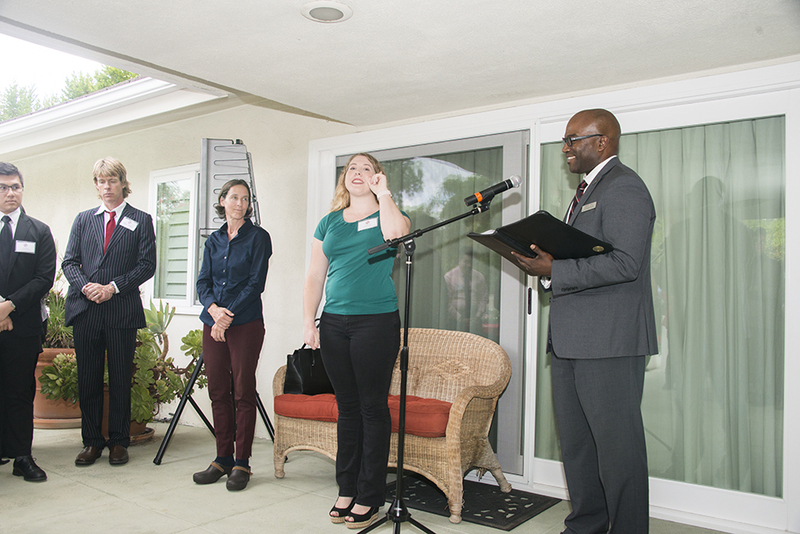 Harrison was joined by administrators, deans and faculty mentors who welcomed the accomplished students. The students represented eight of CSUN’s colleges. Their cohort included ten prior recipients, undocumented students and even a set of twins. University Scholar Jean Pauline Serrano is a sophomore psychology major who aspires to earn master’s and doctoral degrees and to become a professor who teaches and inspires students. She was raised by a single mother and works three jobs: as a supplemental instructor at CSUN in statistics courses, as a private tutor for special-needs students in her neighborhood and as a sales associate at Adidas. Senior psychology major Natalie Rankin, a Presidential Scholar, is a dual citizen of the United States and Mexico. Her work has concentrated on reducing discrimination toward minority groups, including using a video called Off the Streets for Good to put a personal — and local — face on the issue of homelessness. Rankin said she was honored to be able to continue her research with her mentor, professor Luciana Lagana. After graduating from CSUN, Rankin said she hopes to one day become a bilingual psychiatrist who can serve the Latino population. Associate Vice President for Student Access and Support Dwayne Cantrell recognized each of the scholarship recipients and asked them introduce themselves to those in attendance. Harrison thanked the scholarship selection committees and faculty mentors who helped the students. She also encouraged the students to introduce themselves to one another, as they would likely find common ground with respect to the value they place on academic achievement.